I left New York State for a long walkabout in early February of 2017 with no real idea of where I’d be during the August eclipse. I could have been back in New York by then, which probably would have meant a trip to Tennessee. All I knew was that I intended to be somewhere along the path of totality on the fateful day. 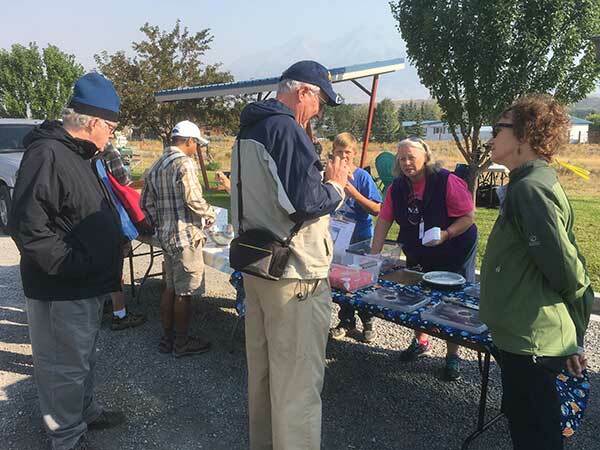 When I accepted an invitation from Glacier National Park to volunteer there to do astronomy outreach, Idaho became the obvious place to be for the eclipse. In fact Glacier’s relative proximity to the path was part of why I accepted the offer. I studied the map of the path. The town of Mackay caught my eye: a very small town, unlikely to draw huge crowds, near the centerline, with good weather prospects. I mentioned my choice at the park, and the ears of Russ Lucas, an amateur astronomer from Kalispell who sometimes helps with astronomy events at Glacier, perked up. 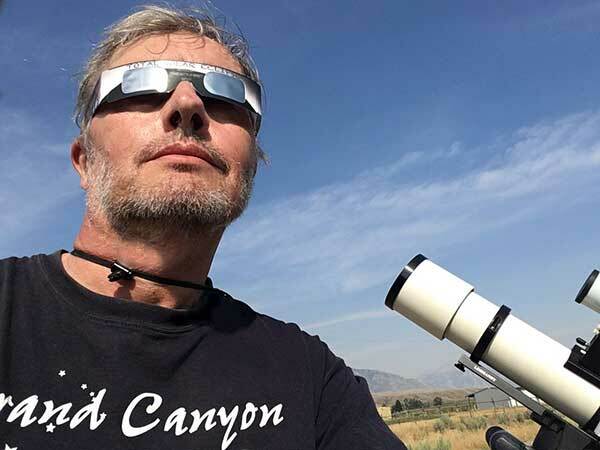 Russ was involved with Citizen CATE, a National Solar Observatory (NSO) project meant to make an unprecedented recording of the eclipse all the way along its path through the USA. 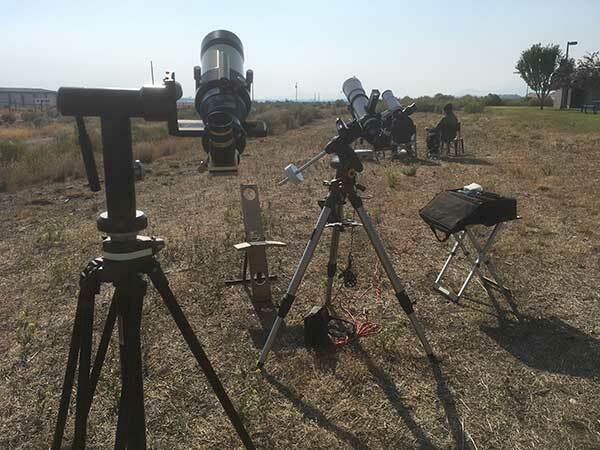 It provided 68 groups and individuals with identical sets of equipment, each including a cheap equatorial mount, a decent small refractor, a small CCD camera, and a laptop. With these 68 stations positioned at intervals along the path, the idea was to record many frames at each station and then combine them into a video that they hoped will reveal certain details about the structure of the Sun’s corona. Russ told me that a friend of his, NASA Solar System Ambassador Lynn Powers from Bozeman, Montana, was going to operate one of these stations in Mackay. I wrote to Lynn and asked if it would be okay for me to share their cloistered spot, and she agreed. Wary of predictions of impossible traffic all along the path on Eclipse Day, I left Glacier for Mackay on Saturday, August 19. The drive took me past some Western scenery I hadn’t yet seen. First was the huge Flathead Lake, mile after mile of it, its dark blue surface whipped up into some pretty big waves on that windy day. Other noteworthy sights included the savage-looking Trapper Peak, Grandview Canyon, and the looming Borah Peak, the tallest mountain in Idaho, just up the road from Mackay. The only city of any size along the route was Missoula, which was not much fun to drive through. I arrived in Mackay, a 390-mile drive, with plenty of daylight to spare. The town’s location wasn’t what I had envisioned. I had imagined a woodsy mountain landscape like the ones that prevail around Glacier. Mackay was more of a high desert, sagebrush setting, short on trees, sitting almost 6,000 feet up. The town itself was exactly as I expected, all 500-and-some-odd people in it, most of whom seemed to be friendly old white guys riding around on 4-wheeled ATVs. I found the little park/rest area whose use the town had allotted to the NASA and NSO volunteers. Already present were Duane Gregg, who would be operating the CATE experiment, and his wife Marjorie. I staked out my space by setting up my telescope mount, converted my little car into Cheap Person Sleeping Pod Mode, consumed my meager travel rations, and went to sleep on the east side of that isolated little village. Lynn Powers presides at the NASA goodies giveaway. Tourists began to make themselves known the next day, but they never swarmed over the place as I feared they might. I was surprised by how many flew into the town’s tiny airstrip in private planes. Ten planes at least landed there, their glide paths taking them about one hundred feet over our heads. Mackay capitalized on the unprecedented influx of people by holding a street fair that occupied the entire one block commercial section of Main Street. Vendors sold a lot of food; nothing I’d eat, of course. Others pitched other kinds of merchandise, but I had no use for bath bombs or used dresses. The Forest Service set up a table that offered useful information to the visitors. One booth sold eclipse glasses for $3. 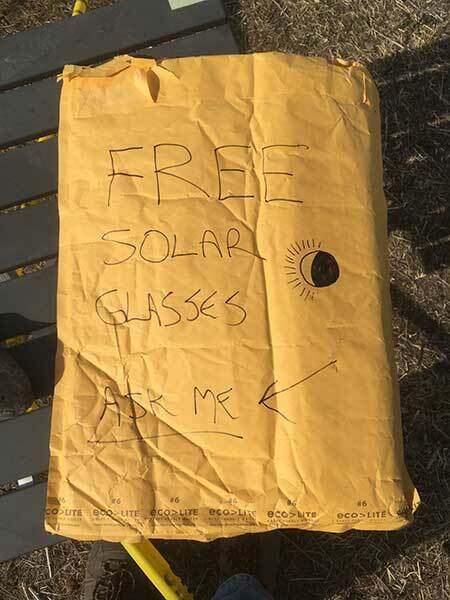 I had in my possession a bunch of free glasses provided by Stephen Ramsden of the Charlie Bates Solar Astronomy Project. In my attempt to defeat capitalism I roamed around offering the free glasses to everyone I saw. I gave away quite a few, but most people already had them from one source or another, so I still have a stock of glasses for 2024. Good thing they don’t go bad. By the way, if you ever visit Mackay, be sure to pronounce it as the locals do, “Mackie”. Otherwise they might take you for a city slicker and a potential liberal. Lynn Powers arrived with some telescopes and various handouts and souvenirs provided by NASA, most of which would be free for the taking on Eclipse Day. As a Solar System Ambassador she and a few helpers would spend that day doing outreach for the visitors who were starting to pile up. Night fell on a busier little town. The sound of revelry reached us from a bar over on Main. I finished setting up my scope and went through the alignment procedure to be ready for the big day. The parking area that had been reserved for us was ribboned off to prevent entry by lowly non-NASA tourists. That night a pair of deputies came by to make sure that those of us who were there were supposed to be there. They were concerned for my welfare when they found out I was sleeping in my car, and one of them offered to bring me a tent. I assured them I was fine, and I was better off without a tent. As it happened, sprinklers came on both nights and wet the tents occupied by Gregg and Lynn, and both nights were also windy, causing the tents to flap around, as they do. I on the other hand was snug. Except when I got out to investigate the UFOs. I saw two or three dim reddish disks, looking very much like heavily eclipsed moons, hanging motionless in the sky. I stared at them from inside the car for quite a while, trying to figure them out. Finally I had to get out and check. They turned out to be red marker balls attached to a power line. A pickup was parked beneath them with its running lights on, just enough to barely illuminate those balls. When the truck left, they went dark. I woke up before dawn. It was cold and windy. The grassy…well, stubbly…area that was the temporary center of scientific inquiry in Mackay was roped off to exclude the peons. By virtue of my proximity to the NSO experiment, it was assumed that I too was with NASA, which I did not dispute, since it gave me the prestige needed to shoo away anyone who dared cross those ropes and enter our sacred space. I finished setting up my “experiments”, munched on some Chex Mix and a banana, and waited. Tourists accumulated just beyond our ropes. The wind declined. The air warmed. At 10:13 we witnessed First Contact, and a murmur of excitement went up from the crowd. Light glinted from a crowd of people wearing safe, ISO-certified solar glasses. The partial phases seemed to pass with unnatural speed. I mentally reviewed my plan of action for the precious two minutes and thirteen seconds of totality. The light grew murky and strange. Shadows sharpened. The landscape dimmed. Venus blazed out plainly. The light of a deep partial eclipse has a thin quality which I suppose might be similar to what you’d experience on the moons of Jupiter or Saturn. And then the last tiny sliver of the Sun was extinguished. The corona flared out. I took the filter off my scope and began to execute my plan. 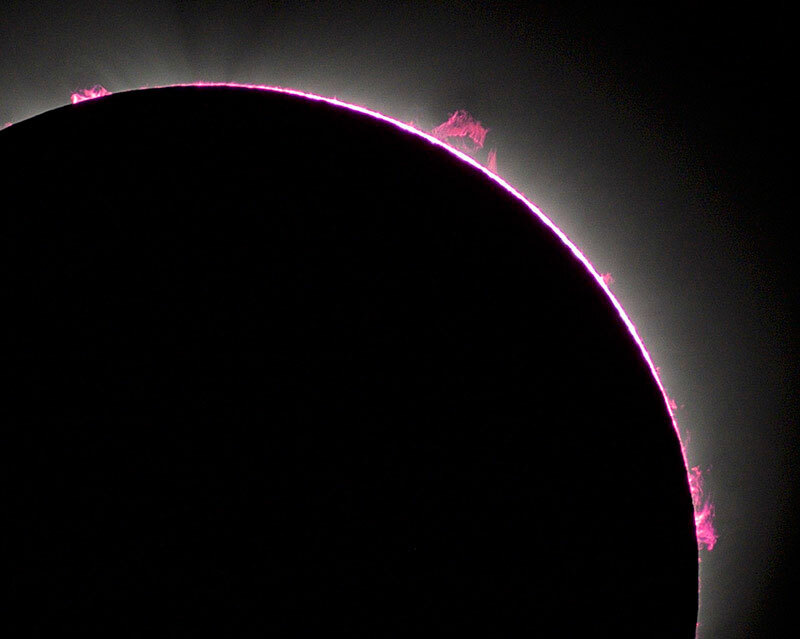 It’s hard to overstate the impact and weirdness of witnessing an eclipsed Sun. The Sun changes into something alien, something you never could have expected. All your life it has been this familiar fierce, bold light, something taken for granted by most people, and rarely considered. And then the Moon gracefully glides in front of that blinding, concealing glare, and the mighty Sun is suddenly seen to have another side, a more feminine side, a ghostly side, a fantastic side, as though you have been transported to some eerie dream world where the deep blue sky is dominated by a serene cosmic flower. It’s as if you are suddenly seeing beyond the facade of some powerful, loud, brassy person, and learning that beyond that is a delicate, beautifully luminous soul that is so rarely seen it’s practically a secret. But this glimpse is fleeting. 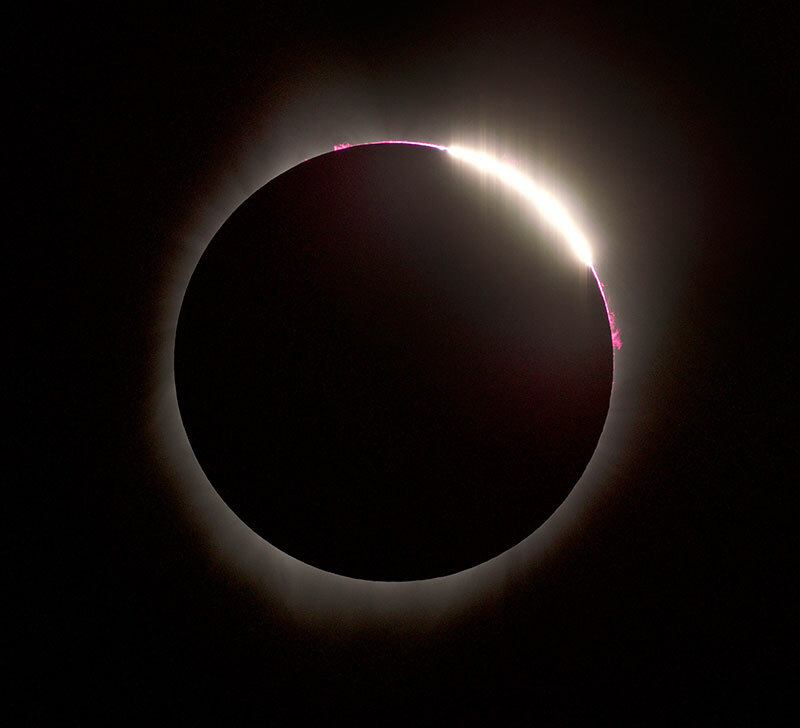 Too soon a bead of brilliance appeared and grew, and the magnificent corona retreated from view. Almost immediately the dim twilight world brightened into something that looked like normal daylight. I was moved, shaken, shaky, and exhilarated. The hoots and howls of my fellow primates told me that they too had been affected. “It was worth it!” some cried. Another guy said gravely “I didn’t think it would really happen.” Can’t trust those scientists, I guess. On the drive home, the Sun showed yet another aspect, dimmed to a baleful red as it was filtered by an immense column of smoke rising from a wildfire on a nearby mountainside. I hope I get to witness this glory again, next time ideally with a fully automated photography rig, so I can spend those precious minutes staring into that apparition without any distraction. 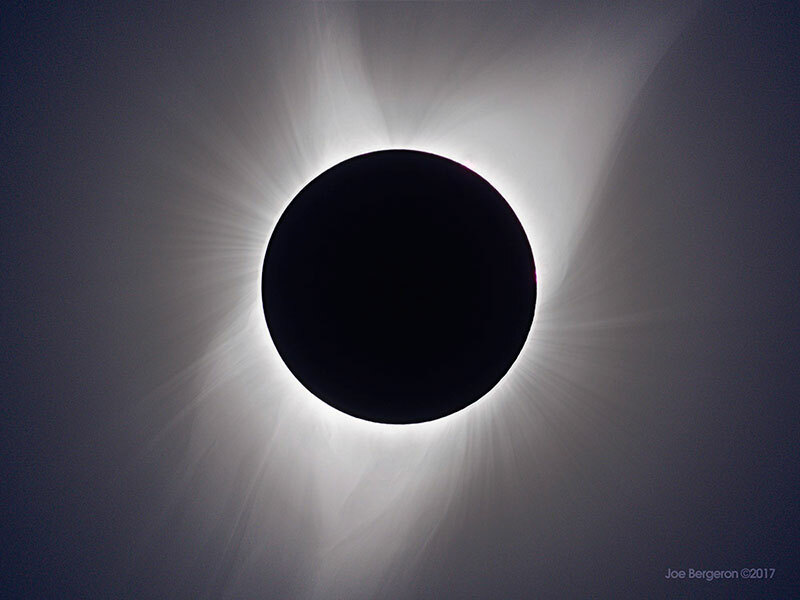 The Corona of the total eclipse of 2017. A composite of five different exposures, shot through my 92mm f/6.6 Astro-Physics refractor. Intended to simulate the view through a telescope.